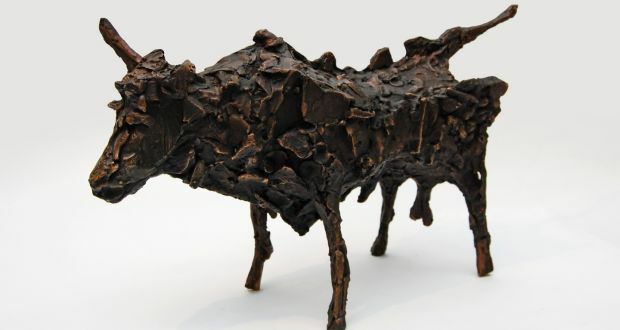 He may be in his late 70s, but John Behan, recognised as one of Ireland’s leading sculptors for nearly five decades, still seems comfortably at home in the physical, labour-intensive world of cast and fabricated metal sculpture. Past and Present is quite a densely populated show. It does not feel crowded but there is plenty of work, all of it distinctively individual and, from the maker’s point of view, exacting. No shortcuts are taken. Behan gives each piece whatever it demands, which is usually a lot. Behan was a metal worker by day and an NCAD student by night, so his work ethic runs deep. What he learned industrially was easily as useful, if not more useful, than academic input. Even as he was finding his voice as an artist, he was fabricating the cultural structures and infrastructure that he and his contemporaries might inhabit and use, and preparing the way for future generations. Behan cofounded Project Arts Centre and the Dublin Art Foundry. Several characteristic themes and motifs are revisited: the bull, a flight of swans, a famine ship, the image of a host of like-minded individuals banded in solidarity. The thematic underpinning of the show relates to 1916, and the band, the host of individuals, in Easter 1916 numbers 16, a melancholy grouping: presumably, as Adrian Frazier notes, those facing death in Kilmainham Gaol. There is also a group of Cumann na mBan. One of the innovations prompted by the Rising was the armoured car, and several of the rough-hewn improvisations employed are reimagined in a series, War Chariots. There is also an expressive Roger Casement. Behan does not lazily reprise any motif. The Behan bull becomes The Bull of Easter (a sacrificial bull, Frazier suggests), and these incarnations of a staple are extremely convincing. In tune with current debates and prophesies about artificial intelligence, the bulls are ingenious amalgams of biology and technology – and, to be fair to him, Behan was doing that well before AI became a real talking point. It’s a good way of conveying the frightening mechanical, physical power of the beast. The swans are The Wild Swans at Coole and there are several fine incarnations of them, including one with a white patina. Famine ships are another recurring subject; there are several exceptional treatments here. They are eloquent, worthy reminders of an unimaginably devastating chapter in Irish history. Oarsmen working in unison are a more optimistic evocation of our relationship to the sea. Do we learn more of John Behan from this show? Possibly so. His best work is thematic. When he becomes minutely involved in telling a specific story, the work can become too grounded in incidental detail, and perhaps too schematic, although his homage to Brian Friel in Death of a Dramatist is specific and effective. Behan remains thoroughly capable of experimenting and exploring, generating magical sculptural statements in the process.